Institute defender Ryan Morrow missing this weekend's trip to Loughgall because of suspension. Institute travel to Loughgall this weekend, knowing three points could see them move into second spot in the Championship. Currently sitting a point behind Ballyclare Comrades, ’Stute will be looking for maximum points at Lakeview Park and hoping Dergview can inflict the fifth straight defeat on the Dixon Park men. We are trying to get everyone’s mentality right, because there’s still a great opportunity to get promoted and you don’t want to be slipping off because you can’t win the league. Despite Comrades poor run of form, ’Stute boss Kevin Deery is only focused on his side and expecting a tough game this weekend, as the Villagers will be full of confidence after last weekend’s win over Ballyclare. 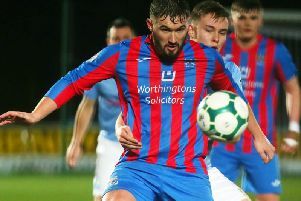 “We know going to Loughgall, that the pitch isn’t the best playing surface but we showed good steel about us the last time up there, we dug in and Stevie Curry scored a couple of great goals,” he said. “Loughgall had a big win last weekend and because of that they’ll be buzzing. “We have to take confidence, we are trying to get everyone’s mentality right, because there’s still a great opportunity to get promoted and you don’t want to be slipping off because you can’t win the league. The Waterside men will be without Ryan Morrow through suspension, while Dean Curry may need some game time in the Reserve team. “Everyone has been training and the only man missing is Ryan, who is suspended,” he added. “He’s one of our regulars going out of our starting team, but Dean Curry has trained the last two weeks; obviously he’s doesn’t have match time, because we haven’t been able to get him games. “We probably feel he needs 90 minutes with Sean’s (Friars) team before we put him in, but you never know in football, if he keeps training well this week we’ll assess it again.